It’s true what they say; writing automated tests is waaaay more fun than manual testing. Unfortunately, fun does not always translate into value for your team. After attempting to automate an AUT for several years, I eventually came to the conclusion that it was not the best use of my time. My test team resources, skills, AUT design and complexity, available tools, and UI-heavy WinForm AUT were a poor mix for automated testing. In the end, I had developed a decent framework, but it consisted of only 28 tests that never found bugs and broke every other week. Recent problems with one of my new AUT’s have motivated me to write a custom automated test framework and give the whole automated test thing another whirl. This new AUT has about 50 reports, each with various filters. I’m seeing a trend where the devs break various reports with every release. Regression testing is as tedious as it gets (completely brainless; perfect to automate) and the devs are gearing up to release another 70 additional reports! …Gulp. In this case, several aspects are pointing towards automated test potential. The basic executed test is ripe for a data-driven automation framework; crawl through 120 reports and perform nearly the same actions and verifications on each. Most broken report errors (I’m targeting) are objectively easy to identify; a big old nasty error displays. I wrote the proof of concept framework last week and am trying to nail down some key decisions (e.g., passing in report parameters vs. programmatically determining them). My team needs me to keep testing, so I can only work on automation during my own time…so it’s slow going. This is my kick-off post. I’ll explain more details in future posts. More importantly, I’ll tell you if it actually adds enough value to justify the time and maintenance it will take. And I promise not to sugar coat my answer, unlike some test automation folks do, IMO. Oh, I’m calling it JART (Jacobson’s Automated Report Tester). Apparently JART is also an acronym for "Just a Real Tragedy. We’ll see. During last fall’s STPCon, I attended a session about showing your team the value of testing. It was presented by a guy from Keen Consultants. He showed us countless graphs and charts we could use to communicate the value of testing to the rest of our team. Boring…zzzzzzzz. In the spirit of my previous post, Can You Judge a Tester by Their Bug List Size?, here is a more creative approach, that is way simpler and IMO more effective, at communicating your value as a tester….wear it! You could change it up with the number of tests you executed, if that sounds more impressive to you. Be sure to wear your shirt on a day the users are learning your AUT. That way, you can pop into the training room and introduce yourself to your users. Most of them didn’t even know you existed. They will love you! 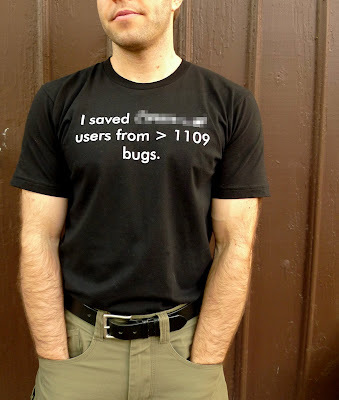 Now I just need to come up with an easy way to increase the bug count on my shirts (e.g., velcro numbers). Because, like all good testers know, the shirt is out-dated within an hour or so. Users change their minds. They save new items in your app, then want to delete those saved items and try again. Does your AUT support this behavior? Did you test for it? While testing, I often look for data saving triggers (e.g., a button that says “Save”). Then I ask myself, "Okay, I saved it by mistake, now what?". Devs and BAs are good at designing the positive paths through your AUTs. But they often overlook the paths needed to support users who change their minds or make mistakes. Your AUT should allow users to correct their mistakes. If not, your team will get stuck writing DB scripts to correct production data for scenarios users could not fix on their own. It’s your job to show your team where these weaknesses are.